Note: This is a screened jam. If you break the rules your game will be disqualified and REMOVED from the Jam! A second entry that nobody wants or asked for. This is a more open theme than past jams, so you'll get extra kudos from judges for liberally slathering your jam game with a thick coating of the theme. Get it in all those nooks and cranies. Bonus idea: Produce a sequel to your own past jam game or someone else's (Remember to ask permission first!) If this is your first time, no sweat! There's a lot to this theme, so let your creativity fly. Make a themed game in 4 weekends! Never made a game before? Who cares. Express yourself. 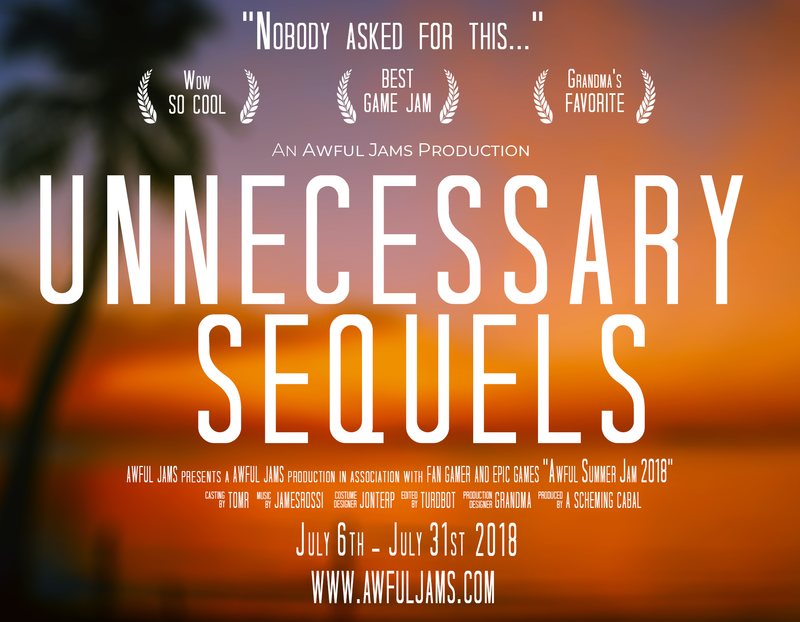 The Awful Summer Jam is a relaxed game jam where you make a video game based around your interpretation of the given theme. If you do a better job than everyone else you could win some sensible prizes for your efforts. At the end of the jam we’ll play all the games live on stream in front of a bunch of other nerds during our regular Gong Show. At the end of the jam our team of professionally trained judges will honestly review your games and pick out category winners! Win a category for brownie points and a sensible prize. Make the best game using Unreal Engine 4! We just couldn’t put you down. You cleverly used the theme better than all the rest. Stories you wove enthralled us. Plot for days. We hear you loud and clear. For SFX and Music. For best sprite based artwork. For best 3D artwork and animations.